I managed to catch up for a wargaming chat down the pub with James and Luke to discuss the new Necron Codex and the forthcoming Tau Codex which is currently rumoured for release in February. Anyway, we got talking about the things which define each army. In the case of the Tau it's Strength 5 basic weapons, Blacksun Filters, Markerlights and Rail Guns. But then James pointed out that most of the guns in the Necron Codex are now Strength 5. So what does that leave Tau with, bearing in mind that Strength 5 was one of their biggest army benefits. "Well, why not put pulse weapons up to Strength 6?" Luke suggested. "Then the Tau might actually be able to kill something. Their weapons are 'plasma based' after all." We debated it at length and it seemed to address a lot of the issues with the current Tau Codex while keeping the Tau 'army identity' as it were. James also suggested that Burst Cannons should have their range increased from 18" to 24", because then they would be worth taking. He also added that it would make Stealth Suits actually function in their role without getting into range to shoot, jumping back, but still getting spotted for being within 21"-24" and killed. Anyway, we can't wait for the new Tau Codex in February if the rumours are true. There's definitely going to be a lot of change to bring them back in line with the current set of armies out there. 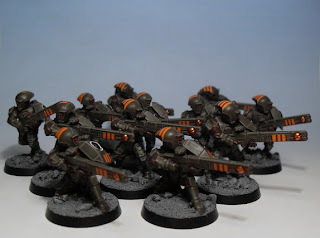 the problem with making the pulse rifles etc STR 6 would be that you would have a basic infantry weapon capable of causing instant death to a lot of models (guard, eldar HQs, etc) which i think would be kinda overpowered against those armies. i can't think of any other army that has that kind of firepower as standard troop kit. Granted, tau are supposed to have superior firepower, but maybe instead of raising the strength of the weapon, make it ap4 or something to that effect. I agree with Spartan. You can't do basic weaponry at S6 due to the massive amount of instant death it puts out there for non MEQ armies. Fixing Fire Warriors is really as simple as making the basic FW (who according to fluff is trained to fight since birth) BS4. S5 with BS 4 is a good place to start when you look at the rumored changes to Markerlights. Squads being able to take either heavy weapons or have drone support based squad weapons will be the other part of fixing the FW. Now let's just hope they get it right elsewhere. If Tau keep less effective versions of the missile launcher and plasma gun, then they need to be able to spam them even more. As it stands right now, MEQ armies are fielding more missile launchers, nearly as cheap and at a better S/AP. This is more a symptom of the era the Tau codex came from, however, as their amount of plasma was pretty sick back in the day. Anyway, I think we were talking about FW and I think I may have gotten off track. Keep up the good work, I was born into 40k as a Tau player and its good to see them still get attention. It's an interesting notion to make pulse rifles strength 6. The major difference between tau weapons however, and necron, was range. Tau have much greater range. I do propose that Tau plasma weaponry including pulse rifles and carbines should have an AP value proportionate to other plasma weaponry. That would require the Pulse rifle to have an AP or 4 or even 3. 3 seems strong because it hurts marines, but then it's SUPPOSED to. Weapons are always being designed to have better penetration of armor that defends against them, and that's the nature of all weapon design. Now both weapons also need a rate of fire increase. Assault 2 for the pulse rifle and assault 3 for the carbine (24" rng for the carbine), or assault 2 for the carbine with the use of the attached grenade launcher to fire effective offensive grenades. As far as the Burst Cannon goes, it is supposed to serve the function as a squad support weapon and force multiplier. In order to do this, it must have at least the same range as a heavy bolter, and either a rate of fire increase to 4 or increase the Str to 6 and AP to 4 or 3. Firewarriors need to have some sort of close combat ability also The fluff will be saved by the fact that no tau commander is going to want to send his firewarriors into CC when their rifles are so much better. The etherial cast clearly practices a martial art, and the firewarriors should have that skill also. It's basic soldier survival. Ie: Combat knife, pulse pistols for Shas'ui, and new wargear options for firewarriors, so people want to take them. St 6 is a bit too much (unless you upgrade our plasma weapons and rail rifles to St 7, missile pods to st 8, melta guns to st 9 and turn the Railguns up to 11). 1) Our most common target has a 3+ save. 2) We only land half the shots we fire with them. Can't do much about number 1 without making the Pulse Rifle AP 3, which I think would be a tad broken in a basic troop choice (though AP 4 has appeal). I am also opposed to making Firewarriors BS 4. What I would like to do is let the Markerlight option for the Firewarrior SHas'ui actually work for the team. That way if he scores his Markerlight hit, the squad is BS 4. Alternatively some sort of special rule in which stationary Tau are BS 4. Another thought is this. Give Pulse Rifles Assault 2, Rapid Fire. Problem solved. It prevents the griping and moaning from Eldar and Guard players who have a lot of +4 saves but at the same time give enough shot volume to effectively do the same thing that giving them AP 4 would do in addition to also giving more strength against MEQ too. I, for one, am hoping that they give the XV-9s the ability to take the Double Barreled Plasma Rifle. (Also giving it rapid fire). 24 Str 6 AP 2 shots a turn? Yes please. Perhaps their weapon strength is determined by range? Interesting, but honestly the problem is not wounding with the pulse weapons, but hitting with enough shots. The current 40k environment (with cover, feel no pain and 3++ going out like candy to screaming babies) requires more volume of fire. Yes, technically, S6 would result in a few more saves, but would introduce a lot of other issues as well (previously mentioned). Then they need the "stand and fire" option from IA4. I think the weapon profile should stay the same for Pulse Rifles maybe add Heavy = BS(4), OR at least Shas'ui @ BS 4 markerlight applyable to squad only. I kinda think it makes more sense if they made Pulse Carbine a 18" Rapid fire / Assault 1. It never made sense to me why the carbine under no circumstances fires more than 1 shot. I think this would be a fair upgrade. I'm hoping they consider some of the Forgeworld models for new HQ choices as well. Pulse Rifle S5 AP5 30" Rapid Fire / Heavy = BS4 AND/OR Shas'ui has BS4 and can use Markerlight to assist own squad. Those would be reasonable upgrades that make sense and not overpowered for Troops. Maybe if there was a way to have a shas'ui upgrade unit to I4 if they have carbines to really flesh out the role of carbine weilding troops. I'm hoping they incorporate some of the Forgeworld Tau ideas too but we'll see about that.